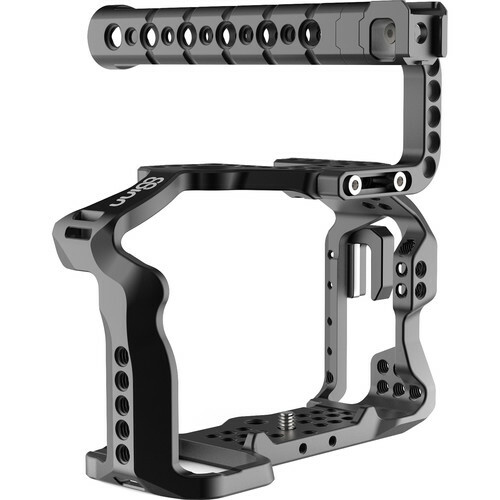 The 8Sinn Cage and Top Handle Basic for Sony a7 III and a7R III is a CNC Machined, anodized aluminum full-armored cage with integrated accessory mounting holes and a reversible top handle system. The cage is suitable for use with the Sony a7 III and a7R III, and features a built-in cold shoe as well as slots for a hand strap of your choice (not included). Threaded 1/4"-20, 3/8"-16, and M4 mounting holes allow you to mount accessories without stressing your camera's body. The top handle attaches with two cap-head screws that hold it secure, and can be mounted either forward- or rear-facing. It features two cold shoe mounts and both 1/4"-20 and 3/8"-16 threaded mounting holes. The cage has two small raised tabs that hold the camera in place and prevent it from twisting. Access to all camera functions, as well as battery and media doors, is maintained. An included HDMI cable clamp mounts on the side of the cage and is adjustable to fit your HDMI cable. The formfitting cage incorporates front tabs that prevent the camera from twisting. The included HDMI cable clamp helps prevent accidental kick outs of an attached HDMI cable. Box Dimensions (LxWxH) 9.3 x 5.6 x 3.1"
WHICH IS THE DIFFERENCE BETWEEN BASIC HANDLE AND PRO? The basic top handle attaches with two cap-head screws that hold it secure. The top handle pro attaches via a NATO rail and clamp system, making it easy to attach and remove from the cage.